For the dog handler or hunter using a smaller breed with neck size up to 9.5” in circumference, the T5 Mini Tracking Collar would be perfect. So if you are running rabbits with beagles, no longer are you the one to worry about where the lead dog has taken the pack, you can now see where they are up to 4 miles away on the screen of your Astro 320 or Alpha 100. There are even beacon lights on the T5 Mini that can be controlled by the Astro 320 or Alpha 100 during low light use that can be seen up to 100 yds away. Weight for the T5 Mini is down to 7.0 oz so even the smallest hunting dogs will have no problems wearing it. 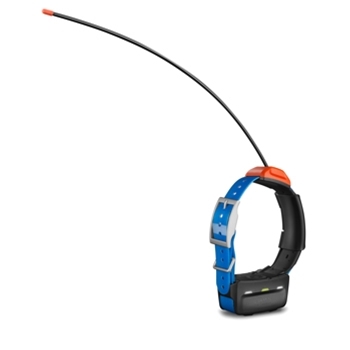 Each Garmin T5 Mini comes with:T 5 Mini dog device with rechargeable lithium-ion battery, 3/4" blue collar strap, Charging clip, AC adapter, Vehicle power cable, Manual and a One-Year Warranty.